Traveling to Austin in the near future? Ever visited Austin, the live music capital of the world? If you are headed this way be sure and check out our list of the 7 – Restaurants with Beer and a Playscape. I love spending time with the kiddos and I enjoy having an ice cold beer too. Why not be able to have the best of both worlds? Well you can check out the list below: 7 – Restaurants with Beer and a Playscape in no particular order. A few are in the Austin metro are and a few are in the burbs, trust me most won’t disappoint. With locations in Austin, Round Rock, West Lake, and Georgetown each Hatcreek offers Strangeland Brewing beer and awesome playscapes. Each location has its own unique playscape and varies by location. Our favorite is the Round Rock location which is located in the same parking lot as the Round Rock Express field (Dell Diamond). Check out the video we recorded at the Westlake Location. Dubbed the Happiest Burger Joint in Texas, Phil’s Icehouse offers amazing burgers and a decent sized playscape for kiddos. Phil’s Icehouse has 3 location around Austin so there is probably not one far from you. Our favorite location is the one located on Burnet Rd. and it is right next to the Amy’s Ice Cream headquarters so they also have delicious Amy’s ice cream ready for you and the kiddos. Phil’s offering of beer is pretty good, the regular domestics, a few other beers on tap, and wine. They just announced a Parents Recess for us parents. Between 3 – 5 PM, happy hour specials on draft beer and wine by glass. What more could you ask for? Located in North Austin, The Domain II area has a huge play area for kids. Also, the play area is located right next to The Brass Tap Domain. Check out my post Dads Guide to: The Domain. I have listed all the fun stuff to do at the Domain with the kiddos and where parents can get a beer. One drawback is that you can’t take the beer out to where the kids play so you have to consumer your beverage on The Brass Taps patio and keep an eye on the kiddos. The other drawback is that there is no fence or gated off area at the Domain kids area. Also, if your child is a runner, they can probably get to the street in a quick second. Older kids should be fine and will be able to run in play in this area with no problem. Just keep an eye out for the younger ones. 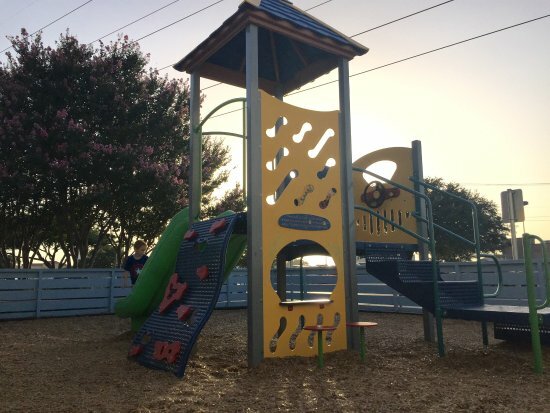 Located At the edge of Milwood on Parmer Lane, parents can grab a beer, some food, and the kiddos can enjoy a little playscape. There is a shaded patio where parents can sit and relax while the kids play. There is a fence around the playscape but it is easily opened and kids also tend to leave it open. Be extra careful with little ones and make sure they don’t wander off to the parking lot or businesses next door. Located off of IH-35 in Round Rock, Kerbey Lane Cafe is open 24 hours and has a little playscape for the kiddos. I do not believe the other locations have a playscape but since the Round Rock location is closest to me, this is our default location. 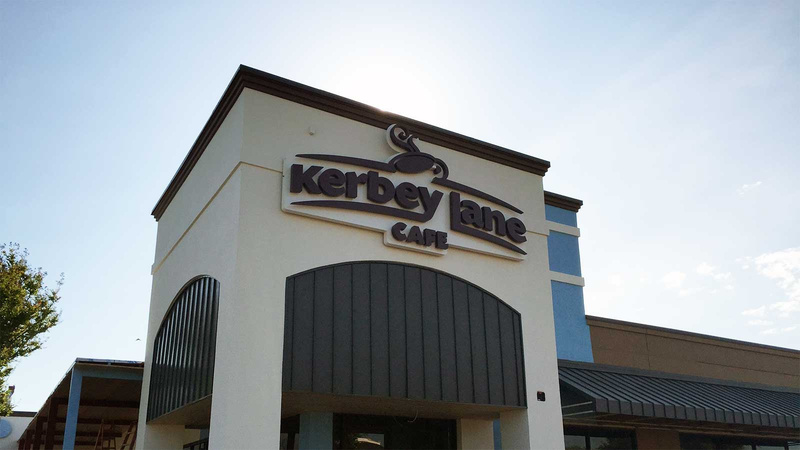 Kerbey Lane is famous for its chips and queso and the Round Rock location is perfect for families. During peak hours there is a wait. One Sunday we tried to go eat at the it had a 2 hour hour wait! But if your kids can stick it out, it’s worth the wait. Also, they can play while y’all wait. Beers on tap include, Thirsty Planet and 512 Brewing, along with some domestics. The playscape are all fenced in and only one way in and one way out. And as added bonus for us parents, kids eat FREE every Tuesday! Lone Star Grille is dubbed Cedar Parks Destination for live music and family dining! Technically it isn’t in Austin, it is located in a suburb of Austin, Cedar Park, a short drive west from Austin. It offer both a playscape for kids and beer for adults, along with a robust menu of burgers and fries, to huge plates of chicken fried steak and sides. In addition, it offers live music weekly. I mean we do live in the live music capital of the world, why wouldn’t there be music? The best part is that most of the acts are Texas Country Musicians, my favorite type of music. Located next to the Dell Diamond, The Salt Lick Round Rock location has pretty much the quintessential Texan starter pack, BBQ, Beer, and a playscape for kids. Also, if you are traveling through ABIA (Austin airport) you can find one of the mini locations inside the terminal. Most people say that the Driftwood location has better tasting BBQ because it is out in the Hill Country but to me, the convenience of the playscape and proximity to Austin, I really enjoy the Round Rock Location. Where are your favorite places to eat with kids? Previous Post: « We Pulled Up To The Beachwalk Resort. And Then My Son Threw Up. You should head south of the river and visit Docs on Brodie, Stubbs Graceland with BBQ and full bar on Hwy 290, Rusty Mule on Hwy 290, and Midway Food Park on Hwy 360 with several food trailers and large playscape. Heck yea! I am going to have to visit places south of the river!